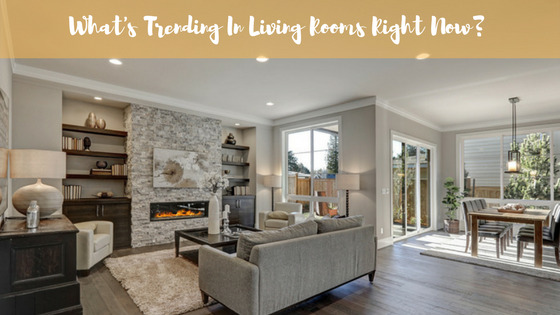 A well-designed living room should create an inviting atmosphere no matter the style. This design philosophy holds true for the most popular living room photos added to Houzz in the last three months. Whether the room features a minimalist aesthetic, a nautical touch or an industrial edge, these spaces provide great decorating ideas. In reverse order, here are the most popular living room photos uploaded from July to September, as measured by the number of people who saved them to their ideabooks in that period. 6. Green with envy. A Massachusetts family of four that loves color turned to designer Kelly Rogers to infuse their living room in vivid shades of green. Rogers selected a pair of celery green velvet swivel chairs and matched them up with a carpet and drapes in emerald green to create a more sophisticated palette that still felt bold and fresh. The drapes “set a gorgeous backdrop to the room, and make the bay look softer and finished,” Rogers says. The space features a contemporary Manhattan sofa by Shine by S.H.O. covered in Chivasso’s Globalist fabric. It is juxtaposed with vintage midcentury chairs by Adrian Pearsall. Underneath, a muted rug by Oscar Isberian grounds the room. 4. The warmth of wood. Homeowners Sarah Zimny and Peter Kovacs took on most of the updates themselves for their two-bedroom home in Monterey Park, California. For the living room, they added the wood feature above the fireplace to hang their television and conceal the wires. Kovacs cut wood pieces to size, then sanded and stained them and created a box. “Anyone can change a light fixture or re-grout tile. There’s a greater sense of value when you’ve done it yourself,” he says. The couple chose the stain to match the wood furniture, and they find the feature brings warmth to the room and anchors the space. 3. Party-ready makeover. After decades of living in her coastal cottage near Kitsilano Beach in Vancouver, Canada, a gracious host in her 70s decided it was time to update her living room and make it party ready for gatherings with friends. The existing fireplace was very traditional with a huge hearth and mantel and recessed nooks on either side. Designer Lauren Webb redesigned the fireplace area, ensuring everything was flush and streamlined, with the TV recessed above the firebox and two doors on either side for storage. On the side of the fireplace wall is a built-in wine cabinet that provides the homeowner easy access to bottles when hosting friends. 2. Cozy conversations. “While she entertains a lot, she doesn’t do it very formally,” designer Shirley Meisels says of her client. “She wanted the living room layout to be conversational, with lots of casual options around her huge coffee table.” A soft rug and throw cushions make gathering around the table on the floor for a meal or a board game comfortable and easy to do. The homeowner has been collecting artwork for years, and Meisels helped her place it throughout the house, such as the large black-and-white, framed photo above the sofa. 1. Dream team. Dy Lynne Dabney is an interior design and her husband, Jack Dabney, is a home builder, so when they combined forces to create their new family home from the ground up in San Antonio, their combined talents were put to good use. Jack covered the living room wall with 6-inch pine shiplap panels. “We have used shiplap in every project we have ever done together as a nod to my New England roots and the charm of older homes,” says Dy Lynne. To accessorize the space, Dy Lynne added ladders draped with throws and baskets filled with pillows to keep essentials for a cozy evening on the sofa within arm’s reach.